For as long as I've been working on the blog (around 10 months) and way before that, I've had long, long, long hair. I've been thinking about getting a cut for a while, I was way over due. 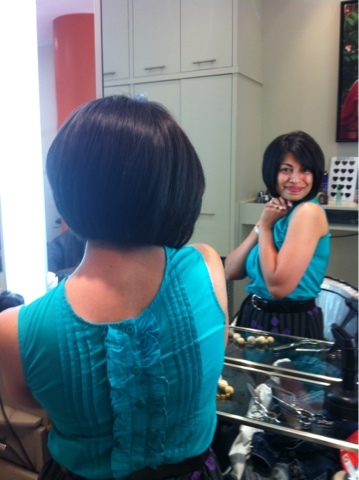 And then on Wednesday evening, on the way home, I decided to walk into a salon and chop it all off. And it feels great. This is me at 7:30pm Eastern. This is the lovely Amber, and she is the brave and talented soul who cut my hair. Thank you Amber. My friend and colleague Piya was exceptionally kind when she saw my haircut at work on Thursday. She asked why I did it. And I gave her a longer answer which she encouraged me to share with you guys: When I was in my undergraduate years at university, I was very politically active, and very militant in a way about my beliefs. And I had made a conscious decision to have short hair. Long hair was for nice girls. Or boring girls. And then I moved to Mexico, and my world view changed, and softened, and I just let my hair grow long. And it stayed long-ish for a long-ish time. But lately, I've wanted a dramatic change in my life. A big push forward in my career. More meaning in the work that I do. And it was time to make a drastic change. Not a little change, not a safe change, but a big change - at least in my hairstyle, to reflect the change I want in other parts of my life. So that's why I did it. And maybe the universe will notice me nudging it for change. And a special thank you for the other hair dressers and the patrons at the salon who were kind enough to take our pictures, and cheer us on when the ponytail was being cut. Love the bob on you, sassy! And very courageous of you both, I wouldn't dare cut it off like that in one swoop. Your smile now is now the firts thing you see, good decision! I did the same thing about six months ago! Except I cut it in the most shapeless way you can imagine and for the next 6 weeks I saw long hair on EVERYONE. I'll never regret doing it though. You look great! I think u look just lovely! Short hair or long, the smile entices. The cut looks great and you look so happy. The 8:30 pm photo is my favorite. Good for you, Natasha! That is a decisive action, and you look wonderfully joyful and excited. I loved hearing a bit about your hair-story, thanks! May the other changes you hope for gather momentum. OMG....this looks so, so fantastic on you, love it! You look so fantastic! Go you! Stunning, and very chic! Yay Natasha! A more mature, more elegant person end result! What a hairstyle can do for a gal, eh?!!!!! 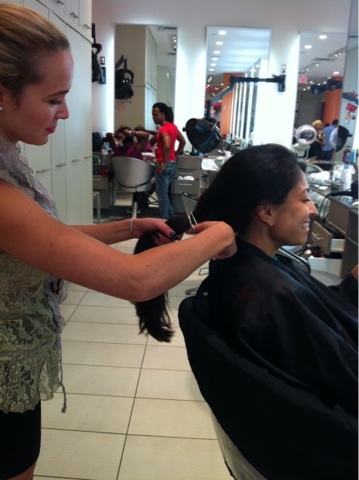 btw... hope you donated your hair to the Princess Margaret Hospital for cancer patients! Here's to change! I love your hair! Very Cute! Way to take the split second initiative. I wish I could do the same with my locks! Your haircut looks great Natasha! It suits you well. Looks gorgeous! Embrace change! It's super mod & cute, definitely a good look. 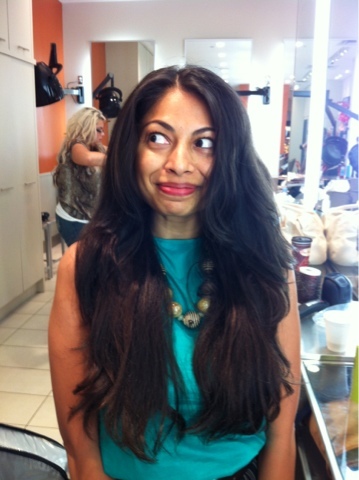 i would DIE for my hair to get as long as urs - love that u took the 'umph' to cut it off - happy weekend doll! I LOVE IT! Love the long hair, but this works so well for you too! Such a change and you look gorgeous! WHOOOTTTTTTT?!?!!?!?!? Awesome - I'm so excited to see it in real life!! My colleague and friend Audra shared this with me as I too am going to chop off my long locks in the next few weeks. I must say, your new 'do makes you look even more FABULOUS -- and I loved reading your hair story. I'm truly inspired. Thank you! Always loved your hair this length. :) It look fabulous! 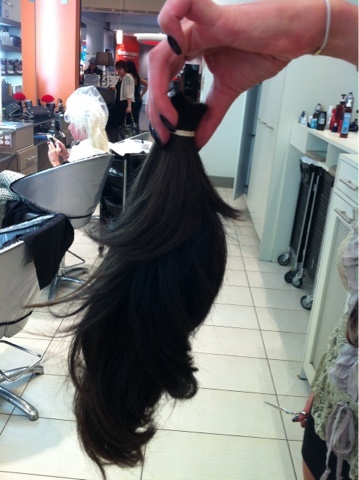 Did you donate your ponytail? wow, congrats! It looks great! You look absolutely amazing. Last year, I donated my hair, and I love my new pixie cut. True, when I wear dresses, I get second glances, but I love it so much. So convenient and chic. That hair suits you so well. You look even more beautiful! Hope the other changes you want happen and your live become better than you imagined! Wow this is crazy amazing. You still look great with your new 'do. Wow such a huge change! It looks amazing, it so suits you! You have a beautiful smile too! wow- very stylish! Changing your hair can be really fun! tats a super cute hair cut, stylish indeed!! i love your hair cut, so cute! OMG it looks so beautiful! Love! Hopefully there is a kiddo or a someone who's a kiddo at heart in your life who can enjoy the mobile we sent! wow you look amazing! it really suits you! You look like you have the Sassoon haircut of the sixties! I love it love it love it..and it will motivate you to make incredible differences in your surroundings and efforts!!!!! You look amazing! I have never been courageous enough to try a full bob, but you look fierce!!! your hair are perfect, great post! 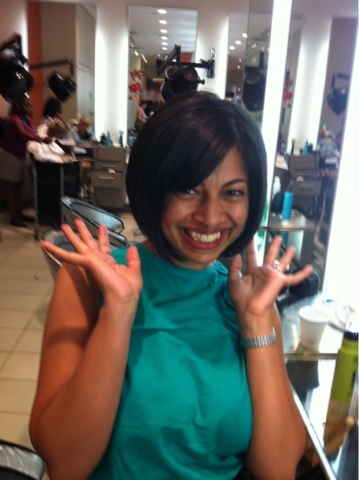 i loved your gorgeous long hair but - girl - your new bob is absolutely awesome! looooooove this hairdo on you! and i love your outfit ... as always. What a great change, your new haircut looks amazing! I hope the reason the cut hair is in a ponytail is that you donated it. I do that every 2 years and it is an incredibly rewarding experience! You look beautiful! Congratulations on the new and exciting changes in your life! OMG!! You look absolutely amazing in this haircut!! I've been meaning to get dat exact same style but have been debating with myself whether to got for it or not!! you look stunning with long hair and short. But the short is so kicky and cute! I absolutely love it and it showcases your gorgeous features. Good choice! So beautiful ! I think it really suits you. Is it going to be hard to style it? I think it really suits you. 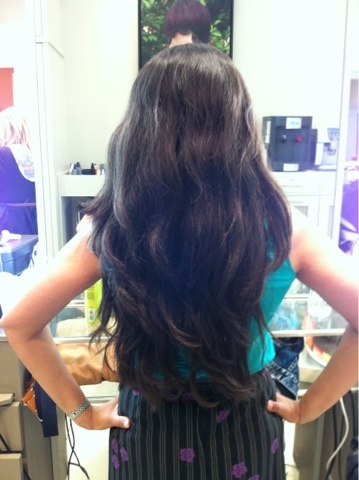 WOW, you had such amazing long hair, but this cut is STUNNING on you!!! Congrats and good luck with the changes in your life!! You look amazing! I love the short hair N! It's good to have a change like that once in awhile and I totally understand your reasoning for it. You look lovely and I can't wait to see outfit pics with your new cut! You look amazing!!! Cheers to an epic turn in life!